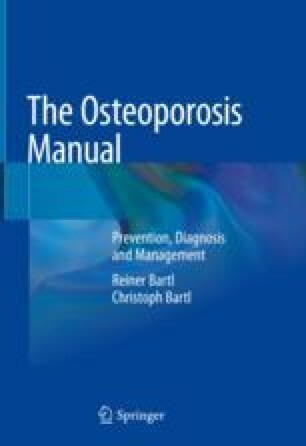 The main goal of osteoporosis treatment is to prevent fragility fractures. Often, a low-trauma fracture of an elderly patient is the first manifestation of osteoporosis, which was an asymptomatic disease until the fracture event. Low-trauma fractures require orthopaedic trauma management including conservative management with casting or splinting, as well as surgical management with osteosynthesis or joint replacement. In elderly patients with reduced bone mass, surgical stabilisation should allow for early weight-bearing in fractures of the lower extremity, the spine and pelvic ring and for early physiotherapy in fractures of the upper extremity. For these fractures with markedly reduced bone loss, special implants are needed to provide stable fracture fixation to allow bone healing. Early fracture management, rapid mobilisation and active physiotherapy following fracture stabilisation are important to preserve joint function, to prevent joint contractures, to provide muscle strengthening for walking security and to prevent complications due to immobilisation.